¡Hola a todos! Yo sé que les gustará la entrada de hoy porque es para anunciar a la ganadora del Give Away que estuve realizando en colaboración con She Inside Traté de subir la lista de participantes a mi pagina de facebook pero no me deja así que tendré que subirla aquí directo. ¡Mucha suerte a todas! Hi everyone! I know that you'll love today's post because I'm announcing the winner of the Give Away in colaboration with She Inside I tried to post a note with the number of participants but facebook didn't let me so I'm putting it here, good luck to everyone! The winner was chosen with random.org and he/she will have 24 hrs to claim his/her prize by sending me an inbox on my facebook page. Then she will choose the two items from the link above. Congratulations to Fabiola Lopez! Remember that you have only 24 hrs to claim you prize or it will be given to another number. Thank you so much to everyone for participated! Even if yoy didn't win do not miss the chance to buy on Sheinide, they have really lovely items and free shipping worldwide! Everything has good quality and it arrives in perfect conditions! OOOOOOOOOH!! 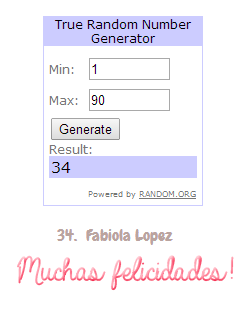 es el primer giveaway que gano >< estoy muy muy emocionada!! Felicidades Hermosa!!!! Tienes que presumir tu Premio!!!! ¿Era la 1? xDDDDDD Qué esperanzas, felicidades a la ganadora^^. Felicidades a la ganadora ^o^ fotitos del premio!